This lesson presents an overview of space weather processes, their impacts on Earth and human activities, and the technologies used for forecasting space weather events. The lesson goal is to provide NWS forecasters a basic understanding of space weather and the operations of NOAA's Space Weather Prediction Center (SWPC). It will be of interest to a general audience as well. Easy to understand if you read thoroughly. Good new things to learn about. This lesson is really helpful in understanding Space Weather. I came away with an understanding of what causes Space Weather. I also understand the many things it now causes on Earth. Excellent lesson! It was a good experience to learn about the suns radiation flare. This lesson was very useful and easy to follow. I highly recommend. I had a good learning experience. This course was very easy to navigate, I liked that I could choose the text version or the audio version. The material provided was very informational and relevant to the topic. Overall, I would definitely recommend this course. Great lesson, learned a lot of new things about the Space Weather. Fascinating primer regarding space weather. Space weather forecasting is becoming more important as technology evolves, and we are really in the infancy stage of this science. I thought it was a good learning experience. Great activity. Short videos that are easy to understand. MetEd taught me everything that I needed to know about space weather! Very informative, very well done! This was interesting and very helpful! This was a great way to learn a great deal of information in a comprehensive yet compact lesson. Answers for multiple choice questions? Why not given? It was easy to access and navigate through the videos were short and interesting. It was a great lesson to understand things about the sun and stars. Loved it! This space weather module answered a lot of my questions. I had others who only presented partial materials on CME process and glad to get full materials in animated video for me to see. Thanks and it was great to get a certificate! The up-to-date new information and connections inspire me to KEEP GOING in the space education process! Make sure to take notes. It was good, worth takin the time to do! The audio was difficult to hear, slightly distorted. I would also like to see some text or captions associated with the media. I preferred the visual version over the audio version, however, I utilized both and they supplement one another. I really enjoyed this lesson! The videos were very helpful. I found the course very useful. My only (minor) criticism would be for the presentation to be a little more energetic. I learned alot about Space Weather and how it is treated. This lesson was very helpful in teaching me more about space weather and was easy to understand and follow along. Wonderful intro to space weather. Great course, I needed somthing like this to quickly learn about space weather for an exercise in Idaho. It was a fun way to learn the material. It was just a blast.... Let me tell you. If you've had at least a formal introduction to astronomy, this lesson is really awesome for furthering your understanding of how the sun directly affects Earth. Video, which was the primary learning format in this lesson, was used effectively. It helped to illustrate the concepts that would seem more complicated in texts. However, the lesson gave no hint of what the test would contain. Maybe a few questions sprinkled throughout the lesson would help. All in all, decent lesson. Easy to understand, with great visuals. Great module!! It was fun and informative and too technical. Informative and to the point. Important for all to know. Identify the correct sequence of phases in the life cycle of a star. State three types of space weather events. Describe their characteristics and effects. Describe the general pattern of sunspot migration during the 11-year cycle. State the characteristics of plasma. List three types of solar energy release and describe their characteristics. Describe and explain the shape of Earth's magnetosphere, and describe its role in space weather events. State the space environment monitors used in GOES and POES satellites. August 2016: HTML and media assets in this lesson have been updated for current browsers and mobile devices. 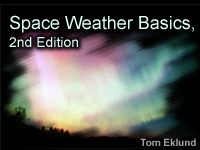 1/10/2012: Changes in this 2nd edition of the lesson include: 1) updating the name of the Space Weather Prediction Center from its former name, the Space Environment Center and giving a brief description of SWPC duties, 2) adding content highlighting new satellites and their role in forecasting space weather, and 3) new material on advancements in space weather prediction models.